CMRLS News: Gotta Love February at the Pearl Library! It's All About Showering Patrons With Really Good Stuff! Gotta Love February at the Pearl Library! It's All About Showering Patrons With Really Good Stuff! This event should not be missed! Seriously! It's the eleventh annual, Come in From the Cold With a Good Book, the Pearl Public Library's star Library Lover's Month program. The library, local businesses and the Friends of the Pearl Library sponsor the two-day, sweet love fest! 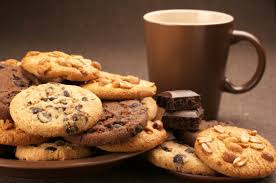 Free cookies, donuts and coffee! Yes, you read that right. It's all free, Wed. Feb. 13 and Valentine's Day, Thurs. Feb. 14 from 9 a.m. to 5 p.m. both days! A huge shout out to Community Coffee, Dunkin' Donuts, The Donut Factory, Sam's Club of Pearl, Wal-Mart of Pearl, That Special Touch Bakery and Simply Southern Cafe and Grill of Flowood for always coming through with fantastic, generous donations! Mmm, mmm, library love soooo good it makes you see sweet birds! 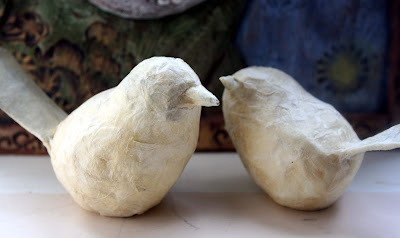 Well, uh, actually you are seeing birds...paper mache ones. 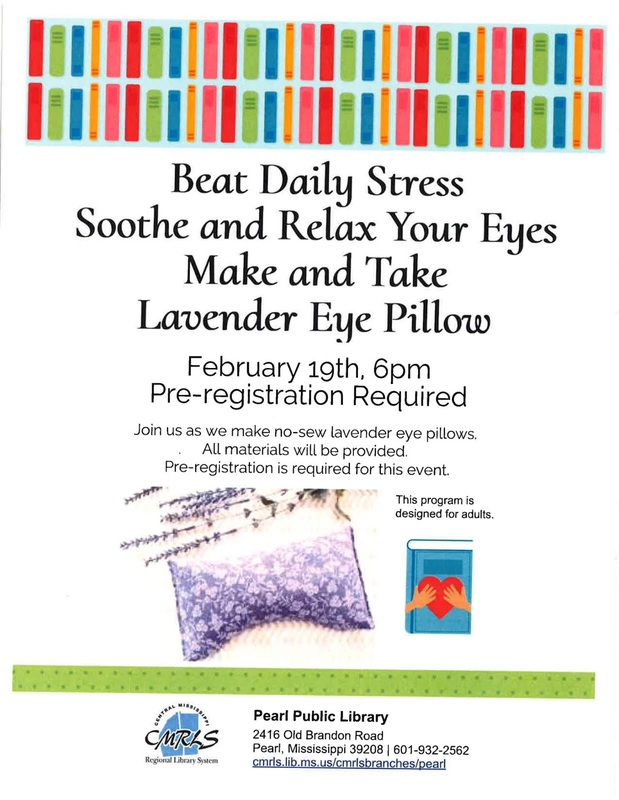 That would be Becky's Simply Crafts adult program Tues. Feb. 5 at 6 p.m. Simply Crafts is a fun, FREE, and informal adult crafting group that meets every first Tuesday of the month at 6:00 at the Pearl Library. There is no material fee, and all supplies are provided. WOW! Doesn't that sound so relaxing? Oh yeah, so relaxing it makes your eyes glaze over. That's OK! Lisa has just the thing for you! 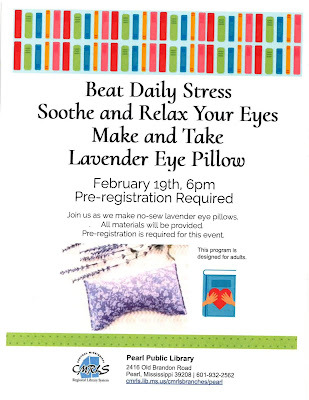 Uh-huh, Make and Take Lavender Eye Pillow, that's Lisa's How-to Tuesday program Feb. 19 at 6 p.m. Registration is required. It's so easy. 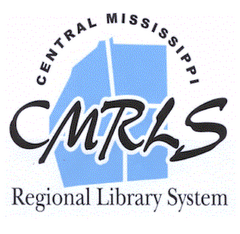 You can go through the CMRLS website at www.cmrls.lib.ms.us, click on EVENTS, choose the How-to Tuesday program and click on VIEW MORE. Or, you can call the library at 601-932-2562 and ask for Lisa or anyone at the reference desk. How-To Tuesday's meet every third Tuesday of the month at 6:00 at the Pearl Library, and, as always, are absolutely FREE. Goodness, all these free, wonderful offerings seem like such a blessing don't they? Sure do. And, hey, the Pearl Library also gives you a chance to be a blessing too! Lisa reports that the Pearl Library Blessing Box started by Team Tungsten Robotics has been a huge success. "We had many generous donations in November and December which sustained us throughout January. We are now in need of more canned food donations to help those in our community who are in need," she said. "We are accepting cereals, boxed foods, canned foods, and hygiene items. Items can be placed directly in the blessing box in our front lobby or brought to the circulation or reference desks if the box is currently full. Thank you for supporting your community!" WOW! So much good stuff! You just have to get in all of the Pearl Library's February LOVE!